Beautiful when grown in a sunny, sheltered position outside in London and the south of England, or in a conservatory elsewhere, this early spring flowering camellia has miniature, fragrant, blush pink, semi-double flowers, about 5cm across, with yellow anthers and cream filaments. Plant growth is medium, spreading and open, with coppery new growth. 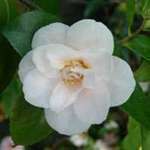 Spring Mist also makes a great plant for a hedge, possibly combined with Camellia Scentuous. I was impressed with the packaging and delivery of the plants. Also the communication prior to dispatch. I was very pleased with the excellent service provided by Trehane - thank you! A beautiful specimen which arrived covered in buds - I can't wait for them to open. Brimming with health and vigour. Trehane's quality cannot be surpassed. Thank you, delivery and packaging excellent and plants as expected. Slight bit of leaf damage on one of the plants - hope its not disease but I'll keep an eye on it. If I have to treat it what should I use?